Length: 8¾ inches (tip of bill to tip of tail). "Redbirds" can be found in nearly every hedge, thicket, or berry patch during the summer, whether in rural areas, towns, or suburbs. Sometimes people see bald-headed cardinals — cardinals without feathers on their heads. This condition usually is reported in summer and fall, when cardinals are molting, and new feathers usually grow in soon after. Northern cardinals forage on the ground or in shrubs for insects, spiders, seeds, fruits, and berries. They frequently visit bird feeders for sunflower, safflower, and other seeds. Statewide. They don’t migrate, though they may move around locally when conditions are bad. The species' overall range covers all the eastern United States, extending into southern Canada, and southward through Mexico to Guatemala and Belize. Cardinals sing from early February through August. Males whistle from the tops of saplings as well as from high in big trees. Cardinals nest in thickets, dense shrubs, and undergrowth. They lay 3 or 4 eggs in a nest built of stems, twigs, bark, grass, and paper, lined with fine grass and hair. Incubation lasts 12–13 days, and the young are fledged in 9–10 days. There are usually two broods a year, though up to four are possible. The northern cardinal is the mascot of many sports organizations. 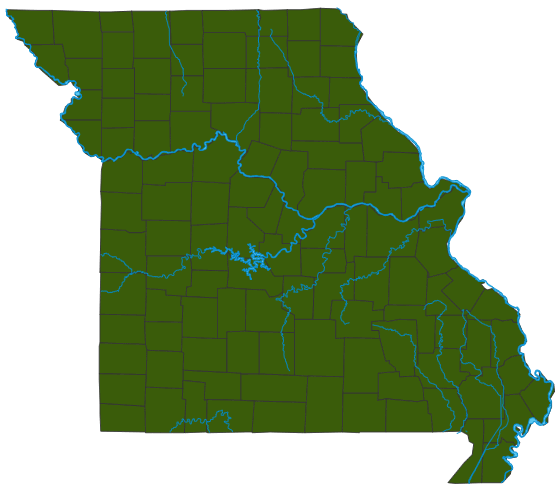 At one time, Missouri had two professional sports teams named after the northern cardinal. This bird is especially loved in the St. Louis area, where it has been the mascot of that city’s professional baseball team since 1900. It’s no wonder this common, conspicuous bird is so popular: the males are a beautiful bright red, with a dashing crest and a spiffy black mask — and they are excellent singers. They commonly appear in backyards, and they're a favorite among beginning bird watchers. Both common and scientific names reflect the fact that this bird was named for the red robes and caps worn by Roman Catholic cardinals. The northern cardinal is the official bird of seven states: Illinois, Indiana, Kentucky, North Carolina, Ohio, Virginia, and West Virginia. An old-fashioned common name for this species was "Virginia nightingale." Apparently American settlers considered its music comparable to that of the sweet-singing common nightingale they'd known in the Old World. That Eurasian bird, mentioned in countless Old World poems and songs, is unrelated to the cardinal. Many predators eat cardinals and their eggs and young. Falcons, hawks, owls, and other raptors can capture adults. Fledglings are often killed by domestic cats. Eggs and nestlings are commonly eaten by snakes, blue jays, and squirrels. Cardinals and other birds that eat seeds and fruits play an important role in helping to disperse seeds, which can pass through the bird’s digestive system intact some distance from the parent plant. To develop and maintain their bright color, cardinals need pigment chemicals called carotenoids in their diet. Indeed, nearly all red, pink, orange, and yellow birds — from tanagers and orioles to flamingos and goldfinches — must eat foods that contain this pigment, or else their feathers will look pale. These are the same pigments that color carrots, apricots, daffodils, egg yolks, and so on, and produce the oranges and yellows of fall leaves. There are two other species in genus Cardinalis: the pyrrhuloxia (peer-oo-LOX-ee-ah), a grayish bird with red highlights, which lives in the desert Southwest, and the vermilion cardinal, which lives in Colombia and Venezuela. Considering the distribution of the three species, it's clear why ours is called the northern cardinal.